Nowadays it’s no surprise to see super fit and active 70- and 80-somethings. But beyond 90? I recently (and belatedly) read “The Incredible Flying Nonagenarian” by Bruce Grierson (New York Times, November 25, 2010) about Olga Kotelko, almost 95, world champion in track and field. Born in 1919, she grew up on a farm in Saskatchewan, the seventh of eleven children. After moving to British Columbia with her two daughters in 1957, she had no time for sports until she retired from teaching in 1984. She first played softball and then, at age 77, tried track and field. Olga enthusiastically pushed herself, hiring a trainer and doing hard-core exercises such as planks, roman chairs, bench presses, and squats. Today, except for Aquafit classes, she takes the Vancouver winter off, but returns to the track in spring: running, jumping, throwing the shot put, javelin, and hammer. At five feet tall, she holds 26 world records. Age-related sarcopenia (loss of muscle mass and function) is inevitable, beginning in the 30s and rapidly accelerating after 75, even with the same level of activity. Olga, however, got stronger in her 80s and 90s. Her unusual resilience has made her a curious case study for scientists studying cellular processes that cause aging and disease. 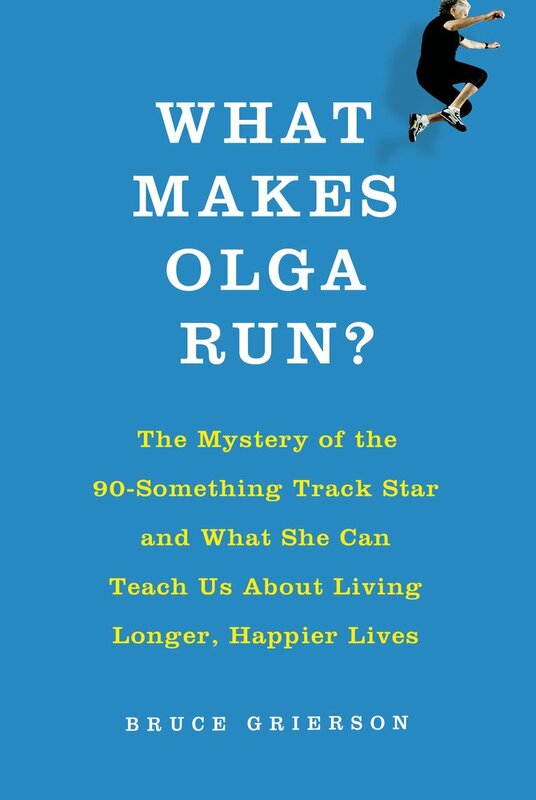 Grierson discusses aging research, and Olga’s case, in his book What Makes Olga Run? published January 2014. In the yoga world, a phenomenal 95-year-old is BKS Iyengar. Hearing about his current activities–practicing asana daily, teaching through his granddaughter, giving a 30-minute speech (without notes) on Guru Purnima last summer–similarly makes me wonder why one person’s 90s can be so different from another’s. Illness, of course, is the wild card and can instantly decimate life as we know it. If we lose our health, then what? That’s probably when our real strength is tested, where our real yoga, if we’ve actually learned anything, is invoked. A late start is not necessarily a disadvantage. Among masters athletes, younger competitors are typically former college jocks, but older ones, past 70, typically start later in life. Maybe late bloomers avoid overuse injury or possess a newcomer’s passion. It’s never too late, as illustrated by Olga and the centenarian marathoner, Fauja Singh. Olga trains daily. Daily. In addition to sports, she follows her own system of deep breathing (inhale for a count of seven, exhale for a count of three, whenever tension arises), diet (very little processed food), and stretching/self-massage (a routine she made up and does in the wee hours). She takes charge of her life. Growing up on a farm instilled in Olga a habit of constant activity, moving all day rather than only during workouts. She is the opposite of sedentary. Motivation–to keep active–is key. In the Times article, an expert cites motivating factors such as competition, workout/sports buddies, and especially one’s spouse. In Olga’s case, however, she has no husband and, while she lives with her daughter and son-in-law, they aren’t involved in her training. Motivation must come from within. Note: Olga died on June 24, 2014, at age 95. Wonderful post. Your great writing inspired me to start my own blog!